The monarch, who is on a state visit to China along with Queen Sonja, was asked by Norwegian reporters how he felt about Chinese officials’ treatment of China’s Uyghur minority in the country. Recent reports from the UN about how Uyghurs have been rounded up and forcibly placed in “re-education” camps have sparked concerns around the world. “We who come from the West are very concerned about human rights,” King Harald said during a press briefing over the weekend in Dunhuang. “We will have a dialogue with China about this, and I will certainly take the opportunity to bring this up.” King Harald is scheduled to meet with the Chinese president in Beijing on Tuesday. King Harald is leading a large Norwegian business delegation to China, and critics have worried that Norwegian industrial and government officials will overlook human rights violations in their zeal to boost trade with China. Amnesty International, meanwhile, has claimed that the human rights situation in China is the worst in 30 years. The monarch noted that China remains one of the world’s leading economies and it was important to be part of it. Amnesty’s leader in Norway, John Peder Egenæs, was nonetheless glad to hear King Harald’s claim that he would address the thorny issue with China’s highest leader. Egenæs was positively surprised by the king’s comments. “He has now created great expectations that this will be a clear point in the royal couple’s part of the state visit,” he told NRK. Norwegian government officials have been especially criticized for being too tame on the issue of human rights in China, out of fear of being put out in the cold again. China froze diplomatic relations with Norway after the Norwegian Nobel Committee awarded a Nobel Peace Prize to the late Chinese human rights activist Liu Xiaobo in 2010. Relations weren’t restored until last year, paving the way for the royals’ current state visit. 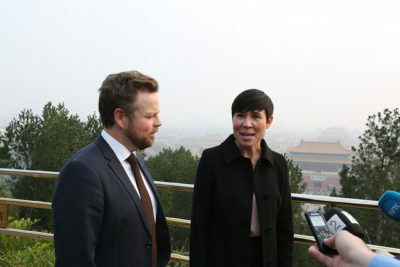 Foreign Minister Ine Eriksen Søreide and Trade Minister Torbjørn Røe Isaksen are also along on the state visit, during which around 40 agreements will be signed between Norwegian and Chinese business officials. Egenæs expects them to be as clear as the monarch on human rights issues. Søreide has earlier stressed that human rights issues are an integrated portion of the government’s foreign policy, and an important part of the agenda for the state visit to China. Eriksen and Isaksen were in Beijing on Sunday and she repeated that it “would be natural” to talk about human rights when she meets Chinese authorities. Eriksen said during their own press briefing there that Chinese officials “are well aware of the concerns we have expressed and we have also heard what the Chinese view on this is.” Human rights were discussed in joint consulatations before the state visit began, Eriksen said, and she will also will take up the issue in her meetings were top Chinese officials. “We have broad cooperation with China that covers more than just human rights,” she told Norwegian reporters. “Human rights will be thoroughly discussed, including the situation in Xinjang.” That’s where the UN believes more than a million members of the Uyghur population are in detention. Eriksen noted, as did King Harald, that China has undergone “positive development in many areas,” including a reduction in poverty, better welfare and education. “But there are other areas where our concern is that it’s not going in a positive direction, especially issues tied to religious minorities and freedom of expression.” She declined to go into detail on what discussions of human rights will entail, but claimed the government was “also on the offensive” regarding human rights, in line with the king.